*The evening was beautiful and peaceful tonight as I sat out in the backyard. Around 7 p.m. or so, Bill and Debbie brought their two dogs over to stay with us for a few days. While outside, I read more of the book I am reading, The Storied Life of A.J. Fikry by Gabrielle Zevin. *As I typically do each day, I walked around the backyard to survey how things are growing, and what is changing in the yard. 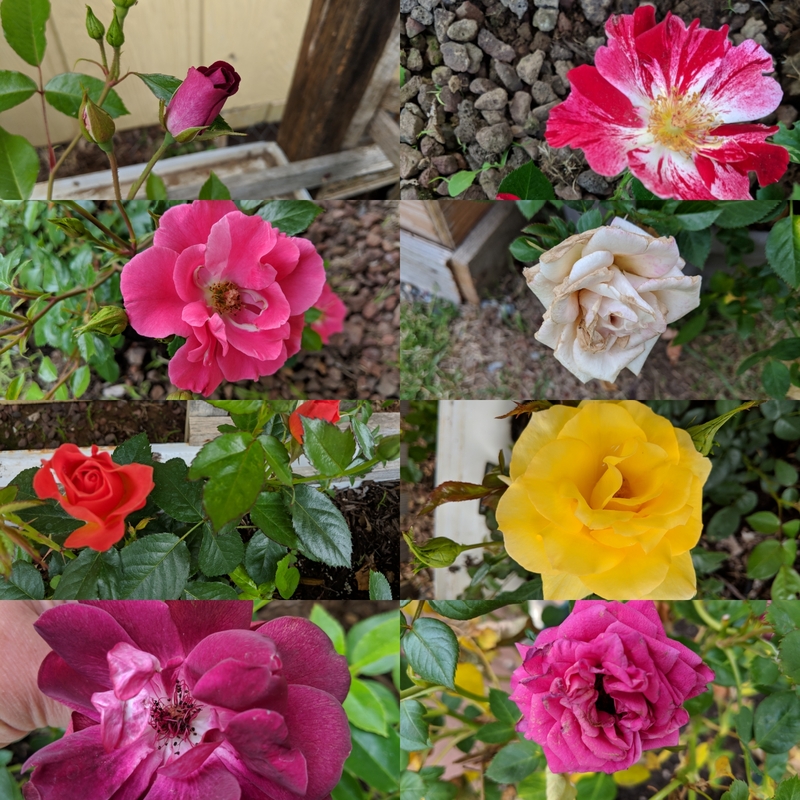 Almost every rose bush I planted last fall is blooming, so I took some photos of all the different roses blooming in the yard this evening. Many of them are very fragrant. *When Paul arrived home from his meetings, he went outside and enjoyed the nice evening as well. He took the dogs outside so they could enjoy a bit more time in the backyard before bedtime. *The carnival is coming to Wallace, and is setting up right in front of the Sierra Silver Mine Tour on Cedar Street. This may have been the cause of a bit of a slower day at work, but I had plenty to keep me busy throughout the day. I am really enjoying working at the new location, the expanded gift store space, and the ice cream parlor. *So now our menagerie of furry friends has grown in the last few days, and, at last count, we have three cats, three dogs and two bunnies. And we are tied in the gender department. Four animals are male, and the other four are female.